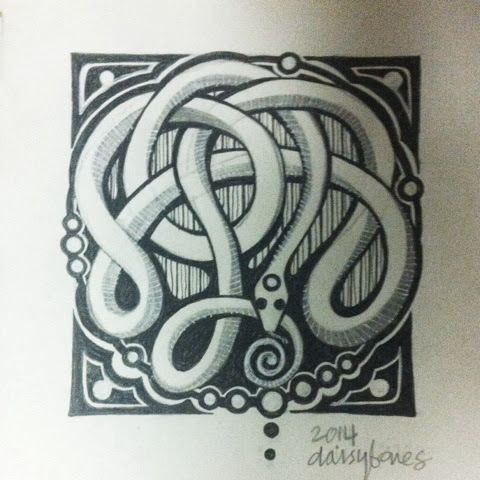 Last doodle of 2013 brings you snake magic: rebirth for a new year. I love the woven swirly design. I'd wanted to draw an ouroboros (a snake swallowing its tail) but the simple circle didn't seem dynamic enough. I love the combination of pen, pencil, and white acrylic ink. These drawings make me really miss printmaking. I love working in the negative on relief cuts but it's way too much for my back now. I'm going to pick up some scratch boards though. I think those will be a decent analogue. Have a beautiful evening, and my reptilian darlings will see you on the flip.